I love my wok, but just don’t use it enough. I wanted to make something delicious with my green beans from our CSA box. All I needed was some fresh ginger and I was good to go for a quick stir fry. I picked up a small pricey jar of Siam jasmine rice at the Meat House, also known as Meat Vegas, thanks to Nicci. Oh how I wish I had Greg’s wine recommendation BEFORE I made this for dinner…check it out below. It’s nice having a wine store owner for a brother-in-law. And that’s just his hobby! Of course I love him, but I’m not gonna lie, having a wine expert in the family certainly sweetens the pot. I’ll make this again, and try it with Greg’s wine pick. I’m running low on my wine supply, anyone up for a trip to Greg’s wine store? Heat oil in a wok over high heat. Add ginger and garlic and saute until fragrant. Add chicken, and stir fry until lightly golden. 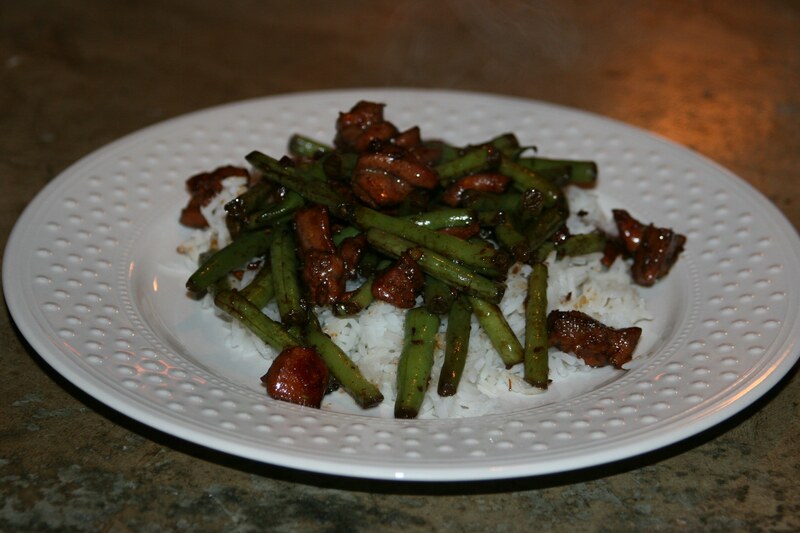 Add green beans, sesame oil and soy sauce, and toss to combine. Add water and cover until green beans are almost done. Remove the lid, and cook until the chicken and green beans have been nicely coated, and water has evaporated. Serve over the fabulous Siam jasmine rice. Lots of choices here for this dish, but I’m settling on a classic pairing – a Riesling from Germany. The 2009 Leitz Dragonstone Riesling is my choice because of its invigorating acidity and high level of residual sugar that comes off as barely sweet. The zesty lime, peach, pink grapefruit, and red currant ally themselves perfectly with the ginger, soy, and sesame oil in your dish. NOTE: I would not serve this wine really cold. I slightly chilled temperature will make this combination sizzle with perfection.